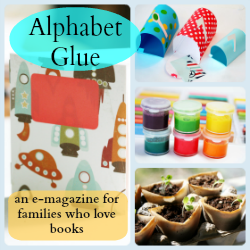 Alphabet Glue: Volume Nine, a New Website and a Great Giveaway, Too! Good Monday morning, all! I'm so very happy to announce the arrival of the ninth issue of Alphabet Glue! I will not lie to you, the production of this latest volume was not among the easier things that I have undertaken lately, primarily because of a truly special combination of half-dead computer and very, very bad head cold. But here it is at long last, and you know, I have to say that I'm pretty pleased with how it all turned out. visiting the new Alphabet Glue website! Indeed, that has been the other part of my work in getting this issue into your virtual laps. It has been just fine to have Alphabet Glue living in an extra room in the attic here at Bird and Little Bird. It has. But, the magazine has grown quite a bit in the last year, and it will benefit from having a little room to stretch. Enter below, and I'll notify the winner via email next Monday, October 15th. In the meantime, you'll find Volume Nine in its brand new nest box, right here. Happy Friday, everyone! I hope that you'll join me in giving a warm welcome to new Bird and Little Bird sponsors, Armadillo Dreams. We are very big into the wooden toys around here, and when Armadillo Dreams first contacted me about sponsorship, I couldn't say "yes" quickly enough. Our wooden play farmhouse can always use a few new tenants, afterall. Owned and operated by husband and wife team Amanda and Dustin, Armadillo Dreams is a perfect example of the ways in which entering into parenthood can provide unexpected creative inspiration. Read on to find out a little more about Armadillo Dreams, the unique wooden toys that they craft and to enter to win one of their wonderful handmade toy sets! Armadillo Dreams is full of handmade wooden toys that children can play and imagine with. We sell figures, animals, pull toys, fantasy toys and teething toys. Some of the toys are painted and others we leave natural. The shop was started in 2010 by myself (Dustin) and my wife Amanda. We live in Redmond, Oregon with our two children Lucy, age five, and Lincoln, who is one. Amanda also has three other Etsy shops that she runs: Wild Plums, Little Vintage Violet, and Violet Plays. When we aren’t working we enjoy family time and anything we can do outside! What was the inspiration for beginning your business? What does your creative process look like? We always wanted our children to have wooden toys but didn’t have a lot of money to buy them. I discovered a passion for woodworking while building a backyard chicken coop/run. When the project was done I felt a need to make more with wood and started thinking of new projects. We then combined my woodworking desire with Amanda’s creative talent/Etsy experience and Armadillo Dreams was born. We love working from home and spending time with our kids and having the freedom to live by our own schedule. We both brainstorm ideas for new toys. Once an idea is decided on, Amanda draws up a pattern. I then trace it onto poplar lumber and head out to the wood shop. Once the toy is cut out and quadruple sanded Amanda wood burns the designs on the wood with a 1000 degree F wood burner. Some of the toys then get painted with AP certified non-toxic water colors while others are left natural. Everything then gets a coat of natural baby/kid safe beeswax polish to seal the paint and wood. That’s about it. Sometimes customers will request color changes, wood burned detail changes or will request to have names added to a toy. We are always happy to include our customers in the design process! We put a lot of care and love into our toys in an effort to make them the best out there! Armadillo Dreams has generously offered one of their Honey Comes From Bees wooden toy sets to one lucky Bird and Little Bird reader. To enter to win, you have a whole myriad of options! You can earn one entry each for liking Armadillo Dreams on Facebook or for following them on Twitter. To gain additional entries, you can also tweet, post to Facebook or blog about the giveaway (or all three!). Just make sure to return to this post and leave a comment letting me know what you've done to spread the word about Armadillo Dreams! I'll pick a winner next Friday, May 11th via random number generator. You can also receive a 10% discount on your Armadillo Dreams purchase throughout the month of May by entering "BIRDANDLITTLEBIRD" at checkout. I, for one, will almost certainly be purchasing wooden robots. To read more about Armadillo Dreams, you can visit their website here. Thank you to Armadillo Dreams!